By lavender at Jan. 22. 2019. These are also the characteristics that most gardeners seek when choosing plants. Very few people are interested in plants that need constant attention and then die the at the slightest provocation. 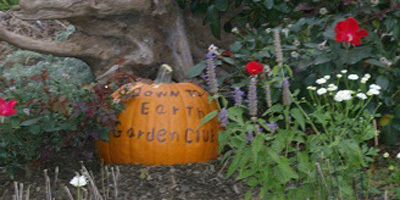 It is then probably not strange that over the last almost 30 years that many of the plants chosen as plant of the year are in the garden club collection, grown by garden club members or have at one time or another been donated by our fellow gardeners. While the specific cultivar chosen may not match what we are growing and sometimes we aren’t exactly sure of the genetics of our plants, we have some version of most of these plants. The first choice in 1990 was Creeping Woodland Phlox (Phlox stolonifera.) We had quite a nice patch of this in John’s garden on the embankment. 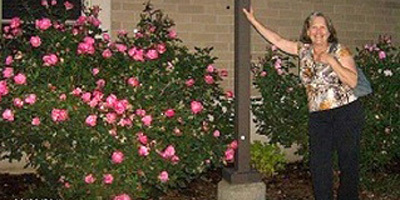 There is still a few patches of it and Monica grows a pink and white variety that is very beautiful. In 1992 the choice was Thread-leaf Coreopsis (Coreopsis verticillata ‘Moonbeam’.) Our original source for this plant was John Cozen who has provided us with many plants over the years. It is growing on the embankment as it needs good drainage and many of us have it in our gardens. n’t become invasive as do many greases. 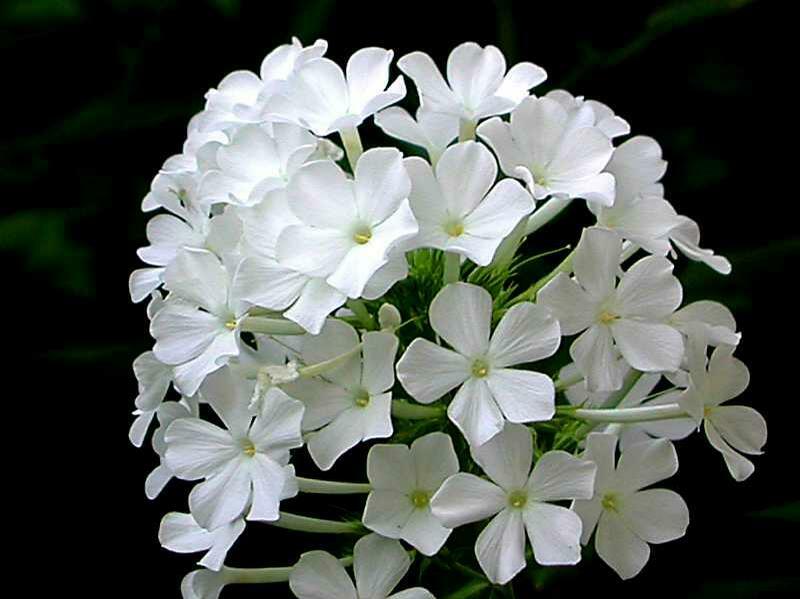 It made the list in 2001 followed in 2002 by Summer Phlox (Phlox paniculata ‘David’.) I’m not sure where we got ‘David’ but many of us grow it including Pat and myself. It was to be a star in the butterfly garden on the walkway but it is much beloved by deer and had to be removed. Various other plants that we grow and love have appeared on the list over the years including Siberian Bugloss (Brunnera macrophylla ‘Jack Frost’), Butterfly Weed (Asclepias tubaeros), Japanese Solomon’s Seal (Polygonatum odoratum ‘Variegatum’), Lenten Rose (Helleborus x hybridus mixture) and many others. 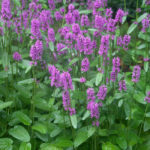 The perennial plant of 2019 is Stachys monieri ‘Hummelo’ sometimes listed as Stachys officinalis ‘Hummelo’ and known as alpine betony. If Stachys brings to mind a fuzzy-leafed silvery plant that is because lamb’s ears (Stachys byzantina) is a near but much more rambunctious relative. 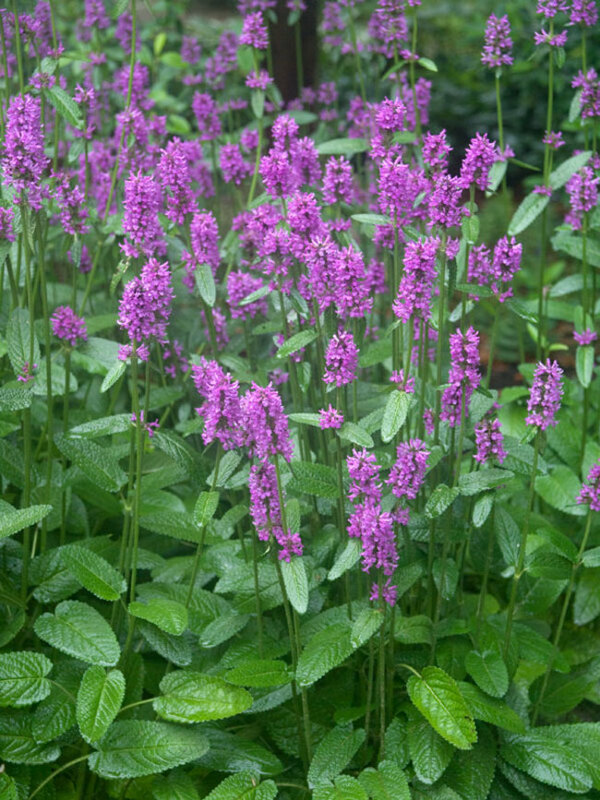 I’ve got two small patches growing under the name “betony” variety or cultivar unknown. I find that it grows in semi-shade in terrible soil and in one case in nothing much more than gravel. Both spots are elevated and have exceptional drainage and are near buildings. They spread slowly from rhizomes, despite being members of the mint family, and make a nice ground cover. The plants that I have are pretty when in flower but not spectacular. So what is to be said for the cultivar ‘Hummelo’ that makes it worthy of Perennial of the year status? It meets the criteria of growing over a wide area. It is hardy to zone 4 as long as it is not planted in ground that is waterlogged. As with many plants cold temperatures combined with wet soil will cause root rot. It will grow as far south as zone 8. That makes it viable in all areas of the US except Florida and a few areas near the Canadian border. There seem to be no soil requirements other than that it be well drained. This is stressed in all accounts of the plant so perhaps this is the one thing that would make it undesirable for regions with clay soil. There are few maintenance requirements. It should be deadheaded to keep it blooming and it needs an average amount of water. For the sake of tidiness the plant can be cut back after it blooms but they are not as unsightly as lamb’s ears after blooming. The plant does have multi-season interest if the winters are mild. It is evergreen where warmer winters prevail. 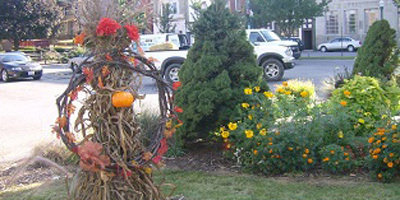 In colder climates it provides an attractive ground cover well into fall. The shiny green leaves arise from a central rosette with a height of 18-24 inches and a spread of 20 inches. The plant blooms late June through August. The flower stocks rise well above the foliage. The violet flowers are small and two lipped, similar to mints. What makes them exceptional is that they are arranged so densely on the leafless stems. ‘Hummelo’ was rated the best Stachys for its prolific and attractive flowers in a study of Stachys by the Chicago Botanical Garden. The flower coverage was rated at 80-100 %. or other herbivores that find garden plants so delicious. This plant can also be used under black walnut trees as it is immune to the juglone emitted by the tree roots that poisons many plants. The plant is easily divided in early spring. It propagates by short rhizomes and spreads slowly. ‘Hummelo’ is listed as a cultivar. This is short for “cultivated variety” which means that generally it is a man made plant and it can only be propagated from divisions or cuttings. It will not come true from seed. 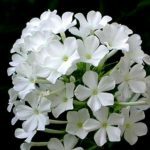 The plants chosen by the Perennial Plant Association are generally winners if for no other reason than they go on for years and years with little care. This year’s selection seems to be not only carefree but floriferous as well. As an added bonus it is attractive to bees, butterflies and other pollinators.